New Delhi: Intel Capital, the strategic investment arm of Intel Corporation, has announced an investment of $23 million in three Indian companies-IndiaMART.com, an online B2B marketplace; One97 Communications, a provider of telecom managed value-added services and Global Talent Track, a vocational educational institute. 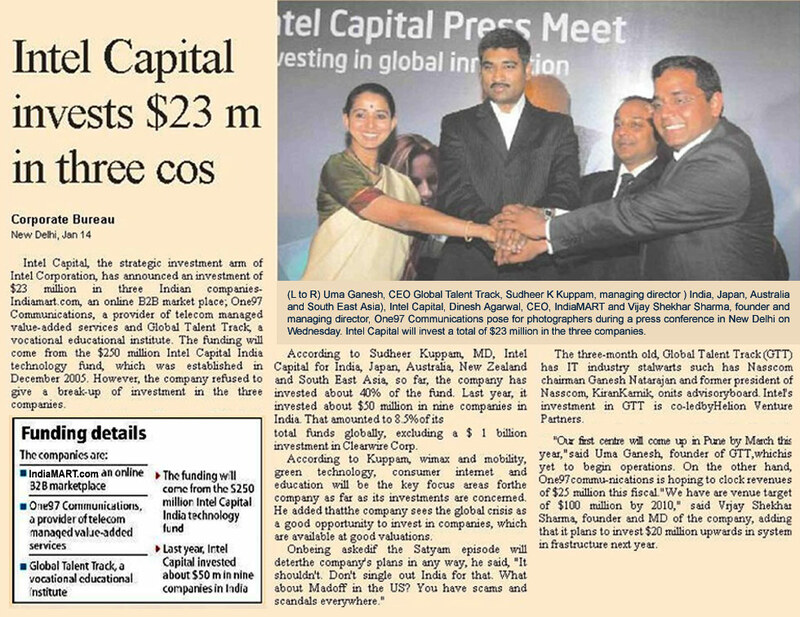 The funding will come from the $250 million Intel Capital India technology fund, which was established in December 2005. However, the company refused to give a break-up of investment in the three companies. According to Sudheer Kuppam, MD, Intel Capital for India, Japan, Australia, New Zealand and South East Asia, so far, the company has invested about 40% of the fund. Last year, it invested about $50 million in nine companies in India. That amounted to 8.5% of its total funds globally, excluding a $1 billion investment in Clearwire Corp. According to Kuppam, wimax and mobility, green technology, consumer internet and education will be the key focus areas for the company as far as its investments are concerned. He added that the company sees the global crisis as a good opportunity to invest in companies, which are available at good valuations. The three-month old, Global Talent Track (GTT) has IT industry stalwarts such has Nasscom chairman Ganesh Natarajan and former president of Nasscom, Kiran Karnik, on its advisory board. Intel’s investment in GTT is co-led by Helion Venture Partners. “Our first centre will come up in Pune by March this year,” said Uma Ganesh, founder of GTT, which is yet to begin operations. On the other hand, One97 communications is hoping to clock revenues of $25 million this fiscal. “We have a revenue target of $100 million by 2010,” said Vijay Shekhar Sharma, founder and MD of the company, adding that it plans to invest $20 million upwards in system infrastructure next year.